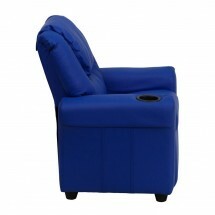 Use the Flash Furniture Contemporary Blue Vinyl Kids Recliner with Cup Holder and Headrest to provide your child with a comfortable seating option. This kids recliner allows your child to rest his drink while playing video games or reading his favorite book. Thanks to its overstuffed padding, this child's recliner provides sink in softness for ultimate relaxation and its solid hardwood frame will endure years of heavy use. 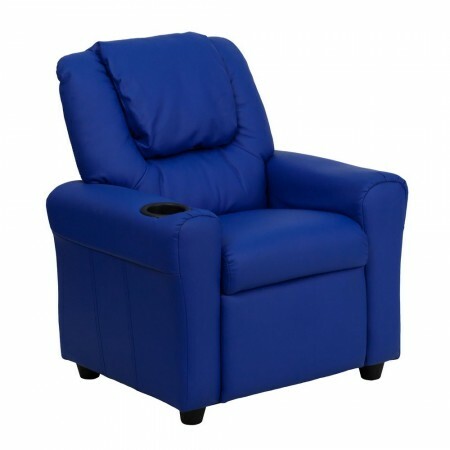 Comfortable and safe to use, this kids recliner has raised plastic feet for stability and is designed with a safety recline mechanism for security.